An early image of the Mur des Drapeaux, from Octobro MMX (October 2010), where the LGBT Pride flag will be invested. One of the oldest notable features of Sandus would be the Mur des Drapeaux in the Palace of State, Kremlum Sandus Province. Established by the then-Lama of the Grand Lamate of Sandefreistikhan, the now-Sôgmô has constantly changed and updated the Mur des Drapeaux to reflect upon the cultural influences of the outside world in on Sandus. 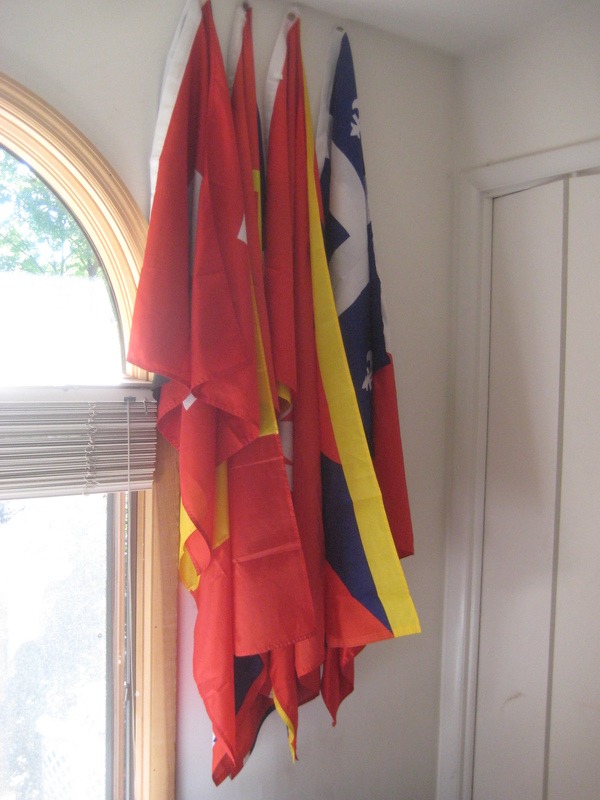 Amongst the distinguished flags that bear an importance to Sandus are Germany, Belgium, Switzerland, the United Kingdom, Tunisia, the Soviet Union, Tibet, Maryland, France, and Québec; the State Flag of Sandus — added just a few months before — stands alone on its sole display, off to the side of all the flags. The “Three Flags” poster from the first LGBT Pride Week held in MMXII (2012) bearing the State, Party, and LGBT Pride Flags. The Office of the Sôgmô received the LGBT Pride flag late Tuesday evening. To celebrate the beginning of the month of Iunio (June), a month corresponding to the LGBT Pride Week celebrated on the week of XXVIII Iunio (28 June) when the Stonewall Revolution took place, the Sôgmô shall induct the LGBTQIA Pride Flag onto the Mur des Drapeaux. The addition of the Pride Flag will be the centre-piece of Sandus’s second time participating in Pride events in June. The Pride Flag will be displayed on the Mur des Drapeaux on I Iunio (1 June), sitting amongst the selection of the Maryland and Tibetan flags.